Like Sportscenter, But for Finance. Everyone’s favorite media mogul, or favorite one to hate, could have reason to frown. 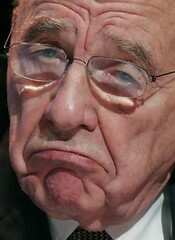 Rupert Murdoch has certainly demonstrated his ability to dominate the news business. But harnessing business news may prove more risky, and possibly less proftable. punchy, lighthearted, with a very apparent political leaning. Thus far, FBN has showcased a similar formula to Fox News. Typically high volume, excited delivery of commentary laden information, from classically attractive, highly opinionated anchors such as Nick Cavuto. And… a singing, Naked Cowboy, who is apparently a millionare. I couldn’t think of a more appropriate metaphor for the American style entrepreneur. He already has a Wikipedia entry. According to the New York Times, the financial news industry is not the most hospitable to newcomers, as evidenced by at least two financial news networks, FNN and CNNfn, which have failed within the last 20 years. But the business news industry is certainly still profitable. Although the overall numbers of viewers are low, especially when compared to general cable news channels and certainly to network news, those audience members are highly attractive to advertisers. their next meal. FBn has a decidedly anti-Wall Street tone, even though they claim to be fostering a network that is more "business friendly." Although their inventive format may not necessarily exclude the average business viewer, and it may even prove interesting to some, it seems questionable that FBN could succeed at prying viewers away from CNBC. But it seems News Corp may not even hope to, instead looking to expand beyond the narrowly focused audiences of other business channels. So what about the, please excuse the joke, more diversified, audience Murdoch and Ailes have themselves said to be courting for FBN? Similar to CNNfn’s prior approach, FBN is focusing on personal finance matters more so than building stock portfolios. But these decidedly more blue hued collars that Murdoch is after, are not as coveted by adverstisers. In addition, yet another finance channel fragments their decidedly captive, but also very small audience even further. Are there enough viewers that are not market oriented investors, but are sufficiently interested in financial news complete with jocular winks and nods, to sustain a 24 hour network? You know the 24-hour TV cycle can endlessly run “How to Save for Your Kids’Education,” “Top 10 Places to Retire,” and “Picking the Right Financial Advisorfor YOU." It took some time before Fox News Channel actually became profitable. And now, for better or for worse, it the most viewed cable news network. It appears Murdoch expects to spend just as handsomely for FBN to flip right-side-up. Will Murdoch manage to adjust the discourse for financial news the way he has for the news industry at large? I question whether there might be a difference between what viewers choose in reference to their pocketbooks, versus their politics. A social networking site for everyone – but at what costs to privacy and security?